A Powerful, Portable Industrial Double-Scrubbing Air Purification Machine for Fast and Ultra Effective Removal of Dust, Heavy Chemical Fumes or Smoke in Medium to Large Rooms, Shops, Labs & More, with 1000 CFM, Up to 1500 Square Foot Coverage and 4 Air Changes Per Hour! Extra Strong Particle Removal--Removes 99.97% of dust, pollen, bacteria, dander, attached viruses, cigarette smoke, radon progenies as small as 0.3 microns. Best For: Extreme chemical gas, VOC and dust control in clean rooms, medical facilities, laboratories, manufacturing, lab hoods, downdraft tables. Powder-Coated Metal Constuction does not off-gas pollutants like many plastic air cleaner do. The Amaircare AirWash Eliminator 2X 6-Stage Industrial Air Cleaning System! The Airwash Eliminator 2X employs a 6-stage in line filtration system that literally double-scrubs polluted air to exhaust the cleanest air possible. The unique filter set up allows for multiple combinations of filters and carbon blends that are easily interchangeable to better fit your situation. The AirWash Eliminator 2X sends the airflow through 3 sets of filters--pre-filter, HEPA and carbon, then sends that already-filtered air through another set of 3 filters, double scrubbing the air. This allows for much more effective and safer removal of tough chemicals, dust, and biological agents than other air scrubbers sending the polluted air through only one set of filters. You can even choose specific blends of carbon for acid gases, formaldehyde and similar compounds or standard carbon for general VOC removal. Top load design makes changing filters fast and easy. Metal Construction Durable metal construction does not emit toxins like some plastics and stands up to wear-and-tear. Double-Scrub Air is filtered through the first three stages, exhausted into a chamber and through the final three filter stages. The Amaircare AirWash Eliminator 2X commercial air cleaner comes with ultra efficient motors and fans. These fans and motors use less electricity and can literally run non-stop for years. In fact, the motors and fans used are run tested for 50,000 hours before they leave the factory for maximum reliability and performance. The Amaircare AirWash Eliminator 2X is your best value for tough chemical fume extraction, dust collection or biological agent control, offering the best industrial air filtration performance, multiple options and 5 year warranty. 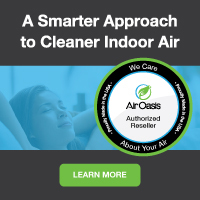 Order yours here at a discount online sales price with free shipping and enjoy cleaner, safer air in your industrial or commercial work areas.